Kenya food is as diverse and fascinating as the county’s many communities. There are staples to be enjoyed and dishes with Western, Indian and Arab influences. The Kenyan diet largely consists of vegetables, meats, maize and other cereals. Fruits are also eaten a lot including oranges, pineapples, apples, mangoes, bananas, pawpaws, melons etc. Among the Kikuyu you find Githeri (prepared mainly from maize and beans), Irio (made from cowpeas, maize and potatoes), Mukimo (made from maize, potatoes and pumpkin leaves), a lot of tubers, including Ngwaci (sweet potatoes), Ndũma (taro root) known in Kenya as arrowroot, Mianga (cassava), Ikwa (yams), legumes like Minji (peas), beans and a Kikuyu bean known as Njahi. Among the Luhya you find Ingoho (chicken), Tsisaka, Miroo and Managu. Among the Luo you find fish, Finger Millet, Mrenda and Dek. The Costal communities have different types of fish, seafood, Mahambri, Wali Wa Nazi (Coconut Rice) and Pilau (Spiced Rice). This simple Kenyan dish is made from kale or collard. The vegetables are sliced very thin and cooked in oil together with a few onions and tomatoes. Salt or stock cube flavoring is added to taste. Sukuma Wiki is normally eaten with ugali or rice. The Kenyan staple gets its name from the Swahili words: sukuma (push) and wiki (week). This is because it is eaten to get through the week. 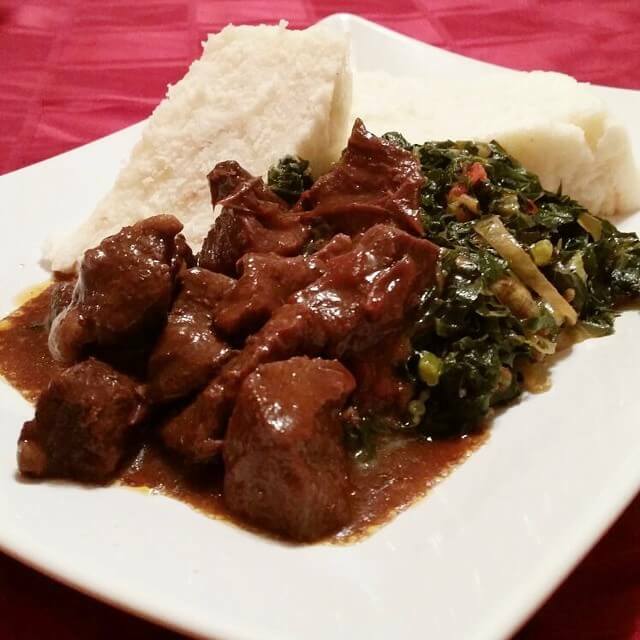 Among the most popular Kenya food, Ugali is prepared by boiling water and then adding cornmeal. The mixture is stirred and turned to form a dense cornmeal paste. Also known as Sembe, the hearty meal goes down well with Sukuma Wiki or meat stew. A popular Kenya cuisine in the rural and urban areas, maize (corn) and beans are boiled then a bit of salt is added. Some people add a few vegetables or their preferred condiment. It is one of the most popular Kenyan dishes, which originates from the Kikuyu community. Cowpeas and potatoes are boiled and then mashed up, green maize are then added to give the mash some extra starch and texture. Irio is best enjoyed with grilled steak in the combination known as “Nyama Na Irio”, beans, meat stew or Sukuma Wiki. 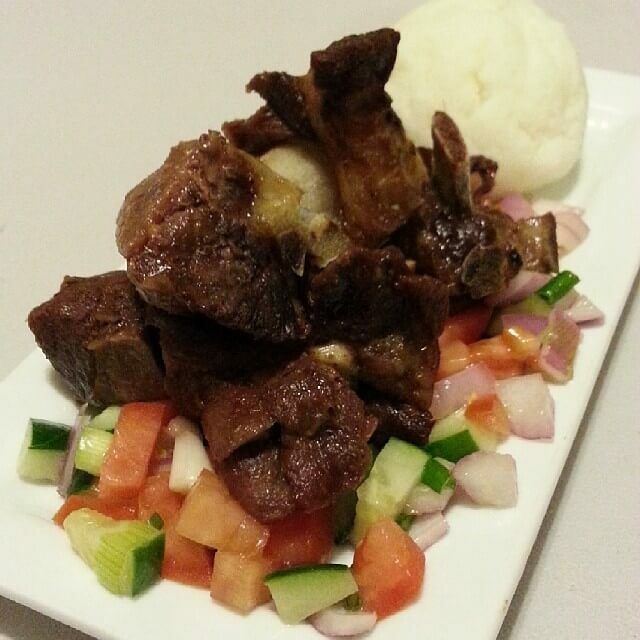 A Kenyan cuisines list is incomplete without Nyama Choma. Beef, chicken or fish is roasted over coal and some salt sprinkled. It is often eaten plain, with Kachumbari (a Kenyan salad) or with ugali. It is flat, thin often unleavened bread. Chapatis can trace their origin from the Indian population. They can be eaten with any kind of stew or as a snack with chai (tea). It is popular at the Kenyan coast. Coconut is grated to create a fragrant twist on boiled white rice. It goes down well with fish, stew or chicken curry. A Kenyan sausage made from goat intestines stuffed full of meat, blood and sometimes pepper. It is a popular Kenyan street meat. 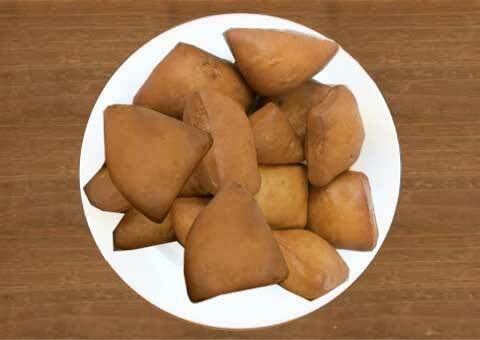 Kenyan doughnuts made from slightly sweetened dough. They can be of any shape and often eaten as snacks. Triangular pockets of pastry wrapper are filled with meat or vegetables. They are deep fried and served with a slice of lime. The easy to follow and beautifully photographed book contains mouthwatering Kenyan cuisines such as; Sambusas, Kachumbari, Ugali, Githeri, Irio, Sukuma Wiki, M’baazi, Maharagwe, Nyama Na Irio, Nyama Choma, Biriani, Ingoho, Kuku Paka, Posho Bateta Nu Shak, Mtuza Wa Samaki and Mandazi. Proceeds from the Kenyan Cookbook go towards helping suffering Kenyan communities.